Echoing still from Sanford Stadium across Georgia, that dull roar you hear is the loud minority of Georgia fans coming out of their “Fire Mark Richt” woodworks in the wake of Georgia’s first loss to Georgia Tech in six years. It is a vocal minority, and even one that had a pretty decent case following the 2010 season– one which saw a 6-7 Georgia team lose to UCF in a no-name bowl game, followed by an 0-2 start in 2011. We need to nip this one in the bud right now, though: Mark Richt isn’t going anywhere, nor should he. We learned of the firing of Nebraska’s Bo Pelini this morning, and there are a lot of people who want to compare Pelini’s Nebraska program to Richt’s at Georgia. It’s a fair comparison, as Georgia’s .704 win percentage since 2007 is one percent lower than Nebraska’s in the Pelini era. Pelini has been a consistent winner at a historically strong program, and that was his downfall. He won 9 or 10 games in each of his seven seasons in Lincoln, and won or shared a division title in four of those seasons. Some may call that stagnant, I call it consistent. Nebraska isn’t exactly a recruiting hotbed, as a large percentage of the Huskers’ best players over the years have hailed from Texas and California. As the game has evolved to incorporate more speed and less brute force, the country boys from Nebraska cornfields have been phased out of the game. After the ridiculous success of Tom Osborne and the underrated (58-19 in six years!) success of Frank Solich, it stands to reason that Nebraska fans would be spoiled. In the modern landscape of college football, Nebraska is in a no-man’s land. I don’t think it will take long for the folks in Lincoln to realize they made a mistake firing a largely successful (albeit overly candid) head coach. Which brings us back to Mark Richt at Georgia. As Andrew wrote this morning, Richt has done everything you can ask of a coach in an era where his conference happens to be the toughest conference in history. He’s averaged 9.6 wins a season (sound familiar? ), moved swiftly to upgrade his staff when something hasn’t worked (see: Martinez, Willie; Grantham, Todd), and has weathered the storm of scores of new coaches’ “hey look what we’re building at _______!” recruiting pitches with yet another top class inbound in February. Sure, there are losses that border on inexplicable for Richt. That’s the nature of the game of college football, and why we devote our falls to consuming, disseminating, and discussing it. One team wins, one team loses. But I would rather be in the hunt on a year-in, year-out basis than hold out hope for a magical run once every four or five years. That’s how you become Arkansas or Auburn. There are people who say Georgia deserves a Nick Saban-type coach. There’s only one Nick Saban, and he is entrenched at Alabama. Although he seems it, not even Saban is impervious to the upset. He went 6-6 in his first year while establishing ‘the system’ in Tuscaloosa, and as demonstrated firsthand, that is not good enough in Athens. Also, what does the list of Sabanesque winners on the market look like right now? Unless someone knows something about exhuming corpses or cloning, I’ll wait for a good response. A known quantity is generally better than the unknown, as tantalizing as the prospects of the unknown sound. Barring catastrophic injuries (as seen in 2013), Georgia is pretty much a lock to win 10, compete for the East, and finish in the top 15 in the country. Unless you are the ‘it’ program like a mid-1990’s Nebraska, early-2000’s Miami, mid-2000’s USC, or current Alabama, that’s all you can ask. A new coach could be a coup a la Pete Carroll at USC, but could leave you with a scorching case of sanctions and Lane Kiffin. Or a new coach could be Lane Kiffin. Or Will Muschamp. Or Gene Chizik (minus Cam Newton). Or any other hot commodity that fails to prove he has the chops at the top level of the sport. A new coach could bring in a ‘system’ that fails to fit the talents of his players, and leave the program in a spiral of mediocrity. Rich Rodriguez is proving again at Arizona that he can win almost anywhere, but Michigan didn’t give him the chance to fully incorporate his system. Now, a consistent power is struggling to reach six wins every year. (FWIW, Nebraska is going the way of Michigan.) If Georgia could drop everything and hire Chip Kelly tomorrow, would fans have the patience to wait out Kelly finding his mobile system QB, speedy receivers, and nimble linemen? I have serious doubts. I bring that up because it underscores another beautiful Richtism: he and his assistants adjust the system to the talent, not the talent to the system. You have the #1 draft pick in Matt Stafford, or the SEC’s all-time leading passer in Aaron Murray? Go up-tempo and vertical. He did that. The best Bulldog since Herschel Walker in the backfield? Go 65/35 run. He did that too. In an ego-driven profession, coaches tend to think there is one way to go about things. Richt has the humility to see when things are wrong, and fix them. Good luck finding that again. So yes, this is a little bit of a rant because of the (very real) similarities characterizing the current states of the Nebraska and Georgia programs. They’re both consistent winners, both historically and recently, and both stand to take a mighty tumble in the wake of a coaching change. Let’s watch over the next couple of years how this Nebraska thing plays out. I’ll take my chances with CMR and another SEC and National Championship contender in 2015. Above and beyond the ridiculous notion that a 9-3 regular season record and potential 10-win season is unacceptable, I’m struggling to sympathize with Georgia fans right now. Last year’s team finished the year 8-5. That 2013 team graduated the Southeastern Conference’s all-time leading passer in Aaron Murray. So, Aaron Murray wasn’t back in 2014. In his place was a first-time starter. That 2013 team was dismantled by injuries on offense. Todd Gurley was hobbled in 2013 but missed even more time in 2014 thanks to an injury and a suspension. Keith Marshall was hobbled in 2013 and missed even more time in 2014. Malcolm Mitchell missed almost all of 2013 and was back in 2014 but accounted for 50 or more receiving yards just three times. Justin Scott-Wesley missed the bulk of 2013 and returned in 2014 to the tune of two catches for 33 yards. Starting fullback Merritt Hall was disqualified before the 2014 season began. Running back Sony Michel missed five games to injury. This year’s squad found just as much health-related adversity on offense. That 2013 team struggled defensively and in a fortuitous (long term) turn of events the entire defensive coaching staff was replaced. Few would argue this transition as anything other than a net positive, but one would be hard-pressed to say this was the easy route to improvement. The 2013 team struggled primarily in the defensive secondary. Starters Josh Harvey-Clemons and Tray Matthews were dismissed in the spring. Starter Shaq Wiggins opted to transfer in the spring. In the fall, Sheldon Dawson opted to leave the team, Rico Johnson was medically disqualified and Shaq Jones was dismissed. A thin secondary got thinner. Did I mention the best Bulldog since Herschel Walker was suspended for four games and came back only to tear his ACL four quarters later? Did I mention that despite all this adversity—rebuilding from a mediocre 2013 campaign while replacing a ton of coaches, a ton of defensive backs and a ton of passing yards and struggling to stay healthy and missing the best player in college football for most of the season—Georgia won nine games and lost three? Put into context: Georgia finished the regular season with a .750 winning percentage. That’s not bad relative to an all-time program winning percentage below .650. And when extenuating circumstantial data is taken into consideration, those nine wins should be even more meaningful. Georgia’s nine wins come at a time when the nation’s best conference—you know, the one the Bulldogs play in—has become so strong that it is threatening its own run of dominance and knocking on the door of the first ever implosion of power. The SEC isn’t too big to fail. The SEC is too good not to fail. And Georgia won nine games during this knockdown-drag-out slugfest despite playing two ranked teams in out-of-conference play. Why the hell are Bulldog fans angry? Disappointed: I’ll give you that, sort of. Frustrated: Sure. Wondering what could have been: That’s kind of what sports are for. In addition to the general misguided Georgia fan angst—the type that wants Mark Richt fired despite the fact that he wins at a higher clip than any Bulldog coach in history against tougher competition than any of those other men faced—two equally irrelevant forces are at play. The first false context has to do with what could have been. If Georgia hadn’t lost to Georgia Tech on Saturday, the playoff picture could still be there. If Missouri had lost to Arkansas the SEC East could still be there. If Georgia hadn’t laid an egg against Florida or found ways to lose against South Carolina, where could the Dawgs be? Those questions are understandable and they merit conversation from fanatics. But those hypothetical scenarios lose credibility when they are used to imply that Georgia should have accomplished more. Yes, Georgia could have easily defeated South Carolina and Georgia Tech and in doing so the Bulldogs would have clinched the SEC East without help from Missouri and Arkansas and Richt’s team would be an SEC Championship away from participating in College Football’s inaugural playoff experiment. That could have happened. But based on all that went against Georgia—much of which was nothing more than dumb old luck—one would be off-base to say that those fantastically favorable things should have happened. The second lens which is adversely filtering this season’s campaign is who Georgia lost to. Georgia didn’t just lose three games. Georgia lost one game to South Carolina, one game to Florida and one game to Georgia Tech, and that is alleged to be much, much worse. Georgia lost to three rivals. Oh, the horror! But this feigned outrage negates the very nature of a rivalry. Georgia and Georgia Tech, for instance, never seems more like a real, meaningful rivalry than when the Yellow Jackets find a way to maneuver past their big brother Bulldogs. This matchup hasn’t felt like a rivalry as of late, but for it to be one Tech was going to have to win some games. Losing unexpectedly to a theoretically inferior Florida team is not an anomaly; it’s the Georgia Way. And lest that read too much like an indictment, it’s the Florida Way sometimes too. And could more have gone wrong against South Carolina? Hell, the game didn’t even start on time because of lightning. Sounds like a weird rivalry to me. Georgia lost to three rivals this year. That happens. Georgia also defeated several rivals this year, but nobody seems to have noticed. The Georgia/Clemson game is now rarely played but the two schools are bitter rivals and Georgia extracted revenge for a 2013 loss in this year’s season-opener. Tennessee football has been down in recent years, but the Bulldogs still found themselves in a bloody battle with the Volunteers and came out victorious. Georgia and Missouri have combined to win each of the last four SEC East division crowns, so a rivalry may be budding. Georgia destroyed Mizzou on the road. Georgia beat the living hell out of an Auburn team that was ranked in the Top 5 in at least one major poll for each of the season’s first 11 weeks. Auburn is a rival. Nobody likes losing to rivals. That’s kind of the nature of the beast, though. But to suddenly ignore the success Georgia had against rivals while simultaneously looking beyond recent successes that Georgia has had against the likes of Georgia Tech, Florida and South Carolina (Georgia beat all three teams in 2013) is short-sided. Furthermore, to take a loss to a team like Georgia Tech and extrapolate it to mean anything long-term or consequential for the future is ridiculous. By the time kickoff arrived that game was damn-near meaningless for a Georgia program that had won 12 of the previous 13. There’s no excuse for the loss, but that performance didn’t define this team. And that question—What defines this 2014 Georgia Bulldogs team?—falsely adds to the frustration of the loss to Tech and other rivals and it lends validity to the missed opportunities storyline. And that’s exactly my point. In our rush to make a judgment of a team whose season isn’t even finished and whose coach is still reeling from the most recent hard-fought game, we’re making broad sweeping generalizations that are false and borrowed. Truth be told, college football is a bit more residual in its nature than any of us want to admit. We want to believe that anything can happen any week. And anything can happen any week. But that’s still not the norm. In our haste we often overlook the fact that even seemingly transient talents stick around for three, four or five years and in doing so they build—both individually and collectively—on a host of experiences. If you think about it, this residual build-up has never been more evident than it was (and is) with the 2014 Georgia Bulldogs. The injuries from last year carried over. The inability to find ways to win close games against Tech and South Carolina is understandable given five losses a year ago. The defensive struggles were different than they were last year, but they were indicative of a work in progress. Hell, even Todd Gurley’s autograph “transgression” dated back to a previous year. In that regard, I’m not going to put a generic label like “disappointing,” “terrible against rivals” or “prone to missing opportunities” on this team. Part of this refusal is because I find those labels to be inaccurate. But the bigger part is because I don’t think we’ll know this team’s identity for another year or two. Or, we may look back and recognize that a team of talented youngsters like Nick Chubb, Sony Michel, Isaiah McKenzie, Jeb Blazevich, Dominic Sanders, etc. learned a lot from the resilience of Todd Gurley, the patient leadership of Hutson Mason, the wise tenacity of David Andrews and the versatility of Damian Swann. And if that’s the case, those youngsters will likely have learned as much in defeat as in victory during the 2014 campaign. That could be one heck of an identity for this team. On Thanksgiving Eve, Georgia flipped its fourth player of the 2015 class. Jarvis Wilson, a 3-star cornerback from Mississippi who was once committed to Mississippi Stae, decided that he’d like to take his talents to Athens, GA.
Wilson has amazing athleticism and pretty good speed. He has decent cover skills, but what stands out to me is how fast he is able to close on the ball. He reminds me of former Dawg, Greg Blue, in that he can absolutely lay the wood. Many believe that Wilson will play cornerback at Georgia, which is obviously a huge need for the Bulldogs. I don’t see him starting as a freshman, but I do think he’ll get a significant amount of playing time. 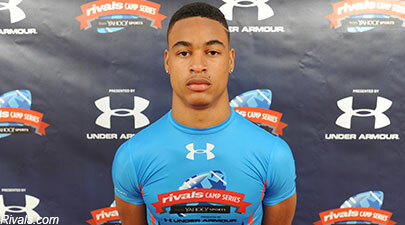 The pickup of Wilson give the Dawgs their 24th commitment and 6th commitment at defensive back. Georgia’s recruiting class now sits at #2 on Rivals, #3 on 247 Sports, and #2 on ESPN. This is without a doubt shaping up to be the best class UGA has ever put together, and there are a lot of big names out there that the Dawgs still have a great shot at landing. Here are Gentry Estes’ five keys for Georgia to beat Georgia Tech. Expect the Unexpected – This was one of my keys for the Florida game earlier this year, and Mark Richt clearly didn’t listen to my warning. Florida put in a wide receiver to hold their first field goal attempt, and he took off and ran 30 yards for a touchdown. Paul Johnson, like Will Muschamp, will do ANYTHING to beat Georgia. Richt has to be on the lookout for trick plays and aggressive play-calling. Be Able to Settle Down – This will be Jeremy Pruitt’s first time facing Tech and the triple option, and as a result, it wouldn’t surprise me one bit if the nerds are able to move the ball pretty well at the beginning of the game. Pruitt must be able to calm his guys down and make solid adjustments if the Dawgs are going to win this game. 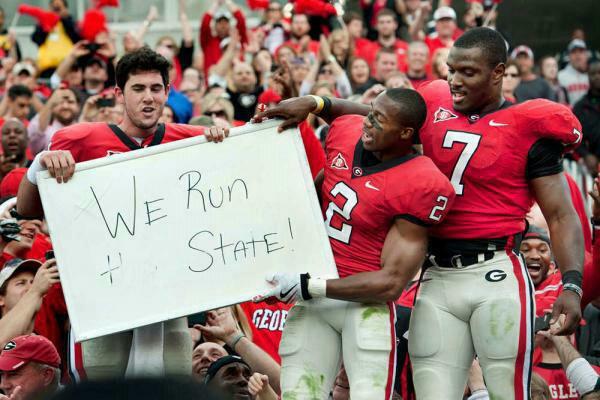 Keep Giving Them the Chubb – Last year, when the Dawgs were losing 20-0 to Tech, they turned to #3. This year, they won’t have that luxury, but they’ll have someone that can still do A LOT of damage. No one has been able to slow down Nick Chubb this year, and Tech’s 71st ranked rushing defense certainly won’t be able to. Georgia needs to repeat what they did against Auburn and just pound the rock over and over and over again. Former Bulldog and current Arizona Cardinal punter, Drew Butler, wrote a really good breakdown of what to expect tomorrow as the Dawgs take on the Yellow Jackets. When our collective worst fear regarding Todd Gurley’s knee was confirmed a few weeks ago, Georgia head coach Mark Richt spoke glowingly of the star running back. The most obvious and accurate summation Richt offered: He loved the big games. Although the legitimacy of the Georgia/Georgia Tech rivalry can be debated, the 2013 matchup was a big game if for no other reason than the large deficit that the Dawgs found themselves facing with a first-time starter at quarterback. In this particular instance, Todd’s love vested itself in all-out trolling of Georgia Tech. Even without Murray, the general consensus among Georgia fans was: Just wait for Gurley. And he made us wait. Through the game’s first 28 minutes Todd Gurley had eight touches for just 25 yards of offense. Then, on Georgia’s final drive of the first half he hauled in two passes for 22 yards and a score. Gurley was a non-factor again in the third quarter, accounting for just seven yards on three touches. And then, he was back. In a big way. 4 carries, 50 yards, 2 TDs. Yeah, he loved the big games. Here are those four overtime plays. It’s all Georgia needed to cap off a brilliant comeback. Todd Gurley Takes Over Against Georgia Tech from The UGA Vault on Vimeo. A big shoutout to the folks at The UGA Vault for this video. See more of their great work on Android or iPhone for free by clicking here.